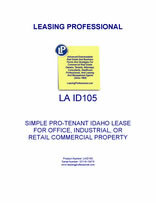 This form is for a single tenant Idaho lease where the tenant has superior leverage. It gives the tenant the right to use the premises for "any legal use," and has very abbreviated remedies for the landlord in the event of a tenant default. It is also pro-tenant in character because of the clauses it does not contain which customarily appear in pro-landlord forms relating to remedies and a variety of other pro-landlord provisions. 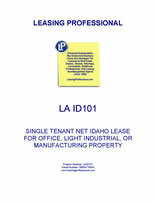 This net form is designed for a single tenant facility located in Idaho leased by a commercial tenant for an office, light industrial or manufacturing use. The base rent for the property is increased by a percentage annually. The tenant is responsible for taxes, maintenance, insurance and utilities. The tenant has the right to sublet portions of the property, and assign the lease to an affiliate or subsidiary without the landlord's consent, but may not assign the entire lease to a third party without the landlord's prior approval. Idaho’s major industries include agriculture and mining, although its northern lakes are attracting a great deal of real estate development and tourism activity recently.